U.S. Ambassador to the U.N. Samantha Power speaks during a meeting of the U.N. General Assembly, Oct. 26, 2016 at U.N. headquarters. For the first time, the United States has abstained from a U.N. resolution urging the lifting of Washington’s nearly 60-year old economic, commercial and financial embargo against Cuba. For the past 25 years, the U.N. General Assembly has held a symbolic annual vote calling for an end to the sanctions, which was imposed during the Cold War. Last year, the international community was nearly unanimous in its call, with only the United States and Israel voting against lifting the embargo. This year both nations abstained. She said the shift is because the policy is not working. “Instead of isolating Cuba, as President Obama has repeatedly said, our policy isolated the United States -- including here at the United Nations,” Power said. But she said that abstaining does not mean that the United States agrees with all of the policies and practices of the Cuban government, particularly on human rights. Nor does it mean Washington agrees with states who say the U.S. actions are contrary to international law and the U.N. Charter. “We categorically reject the statements in the resolution that suggest otherwise,” she said of the General Assembly measure. Dagoberto Rodriguez, Cuba's ambassador in Mexico, takes part with members of the Mexico-Cuba Friendship Group of the Chamber of Deputies during a demonstration against the trade embargo on Cuba by the U.S.
Cuba’s foreign minister, Bruno Rodriguez Parrilla, welcomed the abstention, saying it is a positive step for the future of relations between the two countries, but that the U.S. needs to go further. “Lifting the blockade is the key to be able to advance towards the normalization of relations with the United States; it is what will give some meaning, depth and soundness to what has been achieved so far,” he said. He said executive measures have been positive, but had very limited “scope and effect” and he urged the loosening of controls on telecommunications, banking and other sectors. He said over the last six decades the embargo has cost Cuba some $125 billion in economic and development damages. 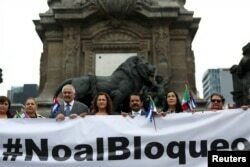 Most member states denounced the blockade as against international law and the principles of the U.N. Charter. “It is our firm belief that differences between states should be settled through engagement, not confrontation, and by inclusion, not isolation,” said Singapore’s Ambassador Burhan Gafoor, speaking for ASEAN countries. Member states also welcomed the thaw in relations between the two nations. “The renewal of relations between these two neighbors signals a new era of engagement for both countries,” said Jamaican Ambassador Courtenay Rattray on behalf of the Caribbean Community (CARICOM). In the nearly two years since President Barack Obama ordered full restoration of diplomatic relations with the island nation, the two countries have reopened embassies in the other country, direct flights have been resumed, and travel restrictions eased. Earlier this month, the U.S. lifted its prohibition on travelers bringing Cuban cigars and rum into the country, but exports of those products to the U.S. continues to be illegal. In March 2016, President Obama made an historic visit to Cuba, marking a milestone in the normalization of relations between the two nations, but only the currently Republican-held U.S. Congress can lift the 56-year old embargo.